Though the weather isn't always as accommodating as one would like in the dead of winter or the heat of summer, Oklahoma is heaven for people who love the outdoors. From wooded regions to mountainous terrain, it offers a great deal in the way of recreational opportunities. And many people are surprised to learn that Oklahoma is filled with beautiful lakes for boating, fishing, and more. Just in the metro area alone, there are a number of major lakes in addition to the many smaller, ​​​local bodies of water. Here is a list of the major Oklahoma City lake. 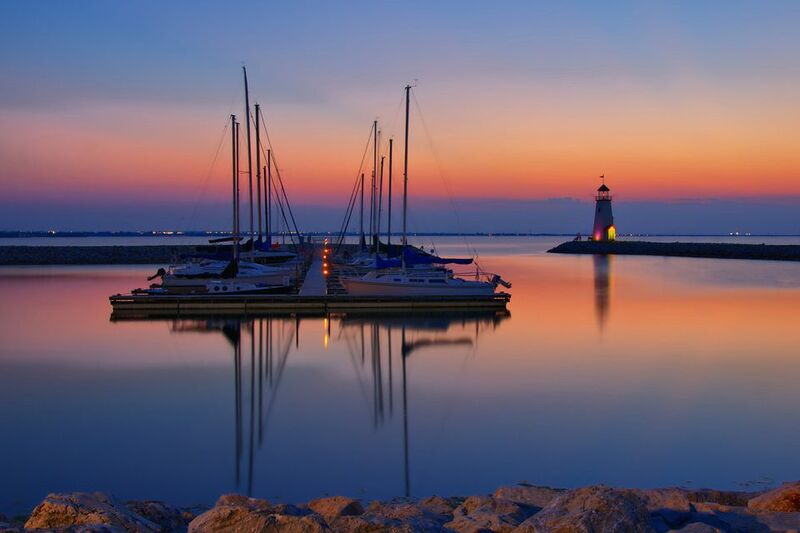 Lake Hefner was built in 1947 and is considered the premier location for sailboating in OKC. In addition to fishing, picnicking, and golfing, Lake Hefner is well-known for outdoor recreation. Trails trace the entire lake and stretch just over nine miles in total. They are 12 feet wide and covered asphalt, and the east side of the lake also contains some six-foot-wide trails specifically for pedestrians. The area features numerous well-kept parks for the kids, and you'll often find families walking, lounging, or flying a kite. The lighthouse is a photo destination, and the ​​​East Wharf restaurants offer some of the best views in the metro. Where: It sits in Northwest Oklahoma City, west of the Lake Hefner Parkway, as far north as Hefner Road, and south past Wilshire. It's also accessible from Northwest Expressway. Features: You can fish, sail (it's home to the Oklahoma City Boat Club), enjoy outdoor recreation trails, use picnic areas, go on playgrounds, use the enclosed and heated fishing dock, and play on the public golf course. Originally constructed in 1919, Oklahoma City's Lake Overholser is the metro's oldest reservoir. It was built as a water supply to a still-operating water treatment plant at NW 6th and Pennsylvania Avenue. Named after the city's 16th mayor, it has several boat ramps, a covered fishing pier, and picnic areas. OKC Riversport operates its ​Adventures program at Overholser​ and offers kayaking, stand-up paddleboarding, and pedal boats. Where: It's in Northwest Oklahoma City, just southwest of Lake Hefner, south of Route 66, and north of I-40 between Council and Morgan Roads. Features: You can enjoy boating, water sports, fishing (there's a covered fishing pier), picnic areas with a covered pavilion, soccer fields, and tennis courts. Originally constructed in 1962 and named after the prominent, longtime Chamber of Commerce director, ​​Lake Stanley Draper is one of Oklahoma City's urban reservoirs. It is a popular recreational spot with its many fishing piers, marina, picnic areas and large, open water for skiing. The bike trails around the lake make for an excellent riding experience. Features: The site features boating, a marina, water sports, fishing off its many covered piers, off-road ATV and biking, and more than 50 campsites. Arcadia Lake is one of the best spots in central Oklahoma for outdoor recreation. Unlike some others on this list, it allows swimming and is an extremely popular spot for camping, picnicking, fishing, skiing, and hiking. Arcadia opened in 1987 after the city and the U.S. Army Corps of Engineers constructed the lake. It serves as a water supply for Edmond as well as flood control for the Deep Fork River Basin. You can enjoy the relatively shallow, roped-off swimming beaches, fish along the dam, or take advantage of some outstanding bird-watching opportunities. The trails are extensive and well-kept for running, walking, or bike riding. Features: This site offers boating, swimming, fishing (primarily large-mouth and striped bass, catfish, crappie, and bluegill), water sports, more than 140 campsites, picnic pavilions, as well as hiking and riding trails. Constructed in the early 1960s as a municipal water reservoir, Lake Thunderbird is a 'popular metro venue for boating, fishing, biking, and other outdoor recreation. It's comprised of 6,070 acres and includes more than 80 miles of shoreline. Taking the short drive from OKC is well worth it considering all the lake has to offer. Where: It sits 13 miles east of Norman, just north of Highway 9. Features: At this lake, you can enjoy boating, fishing (primarily large-mouth bass, crappie, sunfish, channel catfish, white bass, and saugeye), picnic areas, camping areas with change houses, two marinas, a boathouse, concession areas, nature trail, nature center, swim beach, archery range, horseback riding, hunting, eagle watching, and guided eagle tours.